In recent weeks we've seen a lot of Andy Samberg and Adam Sandler together. Marketing for That's My Boy, the new comedy from the duo, has been in full swing and has resulted in a red band trailer as well as a green band trailer and a new poster. But That's My Boy isn't the only movie that that Samberg and Sandler are performing together in this year. 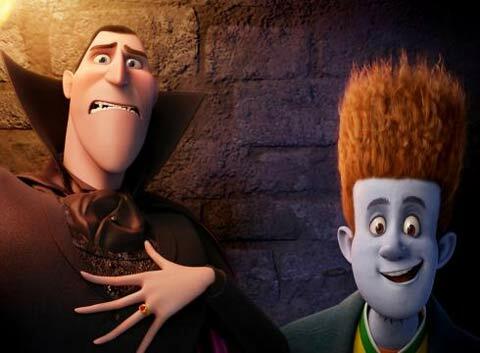 There's also Hotel Transylvania, the new film from Sony Pictures Animation that brings the two comedic actors together as a young human and Dracula. Care to see what that looks like? USA Today has the hookup. The newspaper has published two brand new images from the film that not only give us our first look at Dracula (Sandler) and "Johnnystein" (Samberg), but also the rest of the monster gang, including a couple of werewolves (Steve Buscemi, Molly Shannon); a mummy (Cee Lo Green); the Invisible Man (David Spade); Frankenstein (Kevin James); and Dracula's daughter, Mavis (Selena Gomez). You can see the images below and head over to USA Today to see them full size. 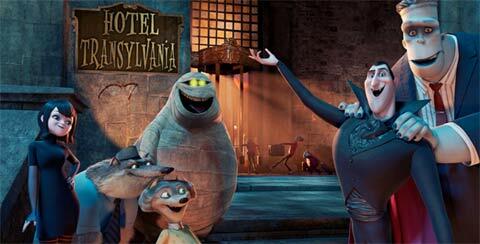 Directed by Genndy Tartakovsky, Hotel Transylvania is set in a world where Dracula has created a monsters-only resort where the beastly can get away from the human world and relax. Things begin to fall apart, however, when a young human male accidentally discovers the hotel and falls in love with Dracula's daughter. The feature film is the first for Tartakovsky, who is best known for working on shows like The Powerpuff Girls, Dexter's Laboratory, and Samurai Jack. Also voicing characters in the movie are Fran Drescher and David Koechner. The movie is due out on September 21st and you can read more about it in our Blend Film Database.